Online videogames may be the world's saving grace due to the skills and mindsets they impart to their players. After playing a game of Modern Warfare 2 with a group of teenagers that horrify you with expletives and hatred you didn't previously know existed, it may be hard to imagine that online gaming could change the world. 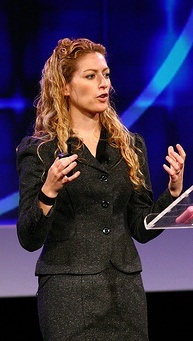 However, alternate reality game designer Jane McGonigal believes it can, and she justifies her belief very convincingly in a talk being shown over on TED. McGonigal has been making games for 10 years, working on ARGs such as Halo 2's I Love Bees and McDonald's The Lost Ring. She's currently directing research and development at the Institute for the Future, a nonprofit research group. She says her goal is: "To make it as easy to save the world in real life as it is to save the world in online games." Humanity currently plays 3 billion hours of online games a week, but that's not nearly enough according to McGonigal. To save the world, she says we need to be playing 21 billion hours a week, and there's a legitimate reason behind this opinion. Think about how you feel when playing an online game like Halo 3 or World of Warcraft. Against all odds, it's still easy to be optimistic, and cooperation with others is often the only way to survive. Even when victory seems slim, it's easy to keep trying for an "Epic Win," as McGonigal calls it, in an online game. McGonigal believes that the best versions of ourselves are expressed in online gaming. We're not as anxious or scared of failure as we are in real life, so we're more likely to achieve, and we're also more likely to learn how to collaborate with others in challenging situations. On a grand scale, the 5.93 million years that McGonigal points out the world has spent playing World of Warcraft is affecting our cooperative abilities, which could easily transfer to solving the problems of world hunger, poverty, or climate change. Another interesting statistic McGonigal relates is that the average person will play 10,000 hours of online games by the time he/she hits the age of 21, which is approximately the amount of time it takes to go from 5th grade to the completion of high school. Online gaming is a "parallel track of education" according to McGonigal, which creates "virtuosos" of collaboration and problem solving. The problem is that people seem to believe they only have the power to change virtual worlds, rather than the real world too. Alternate reality games such as McGonigal's World Without Oil and Superstruct challenge players to use these collaborative skills to make an impact on the world, including coming up with solutions to an oil crisis or figuring out how to solve the problems of 2019. Whether you're playing games such as these, or putting 40 hours a week into World of Warcraft, it ultimately doesn't matter, because the skill sets subconsciously taught in both are creating a population more capable of working together to save the world. McGonigal's full talk is only around 20 minutes and a pretty interesting view.